Take Control of Air, indoors. In the recent past, air pollution has become a major cause of concern for the people living in India. Many renowned institutes and environmental bodies have conducted studies and tests to showcase the gravity of the matter. In fact, studies have implied that India is the third largest contributor of greenhouse gases after China and the United States. However, the most alarming fact of all is that these studies comprise of the indoor air quality, as well. It may seem shocking, but our indoor air quality is proved to be 10 times worse than the outdoor air quality. This theory has been validated by various studies and statistics, conducted till date. There are various sources that lead to indoor air pollution such as combustion appliances, building and decorative materials, carpets and varnishing with high volatile organic compounds, and particulate matter that gets trapped inside the room due to poor ventilation. Until 2016, we were unknowingly getting used to the impact of outdoor air pollution, as it was invisible to the naked eyes. However, the myth was blown away during Diwali 2016, when Delhi was under major scrutiny due to crossing dangerous level of air pollution for indoor and outdoor air, alike. People could actually see the harmful particles present in the polluted air and it appeared nothing less of a doomsday. Since then, it became a popular belief that a fighting mechanism is necessary to get breathable air , at least, during Diwali. It is believed that seasonal changes and fog during winters cause airborne diseases. This is in fact, is a misconception. Air Quality Index all over India proves that air quality remains the same throughout the year with a slight increase of pollution during Diwali. Hence, air purifiers become a necessity, no matter the weather and climate. Bad indoor air quality also signifies that we are at a higher risk of suffering from chest congestion, rhinitis, blocked nose, asthma, ischaemic heart disease, chronic obstructive pulmonary disease (COPD) and lung cancer. With such severe health implications, it has become imperative for an urgent intervention, to maintain a healthy and sustainable living. To curb the ill-effects of indoor air pollution, it is highly recommended to initiate the use of technologically advanced air purifiers. The market is flooded with different types of air purifiers that guarantee pure air. However, Daikin air purifiers are here to break the clutter as they are equipped with two advanced technologies i.e., HEPA filter and Streamer Discharge technology. An air purifier that comes with advanced technology like these, enables you to take control of the air you breathe in. Wondering how HEPA filter and Streamer Discharge technology can cleanse the air and help you lead a better life? HEPA stands for High Efficiency Particulate Air. It is a filter that can remove at least 99.97% of airborne particles, which are 0.3 micrometers (µm) in diameter or larger. Simply put, a HEPA filter traps harmful particles such as pollen, dust mites, tobacco smoke, and other pollutants. So, the chances of potential pulmonary side-effects like asthma and other pulmonary diseases, and even allergies, are much lower with HEPA purifiers. Therefore, when it comes to health and safety of our physical being, nothing works better than HEPA filters. Essentially, HEPA filters consist of a mat of randomly arranged fibers that are typically composed of fiberglass. While these fibers do not let bigger particles pass through a certain point, they most definitely seek out the smaller particles and pollutants and diffuse them. Coming to the Streamer Discharge technology, it’s safe to say that it decomposes and removes allergens such as mold, mites, bacteria, virus, and pollen along with unpleasant odours with its six-stage filtration process. These harmful substances are destroyed through the process of oxidation and further broken down into safe nitrogen, oxygen atoms and water molecules, ensuring absolutely clean indoor air. With constant innovation in comfort and energy efficiency, Daikin air purifiers serve the benchmark for quality within the industry. With the perfect combination of HEPA filter and Streamer Discharge technology, these air purifiers have become a must-have. 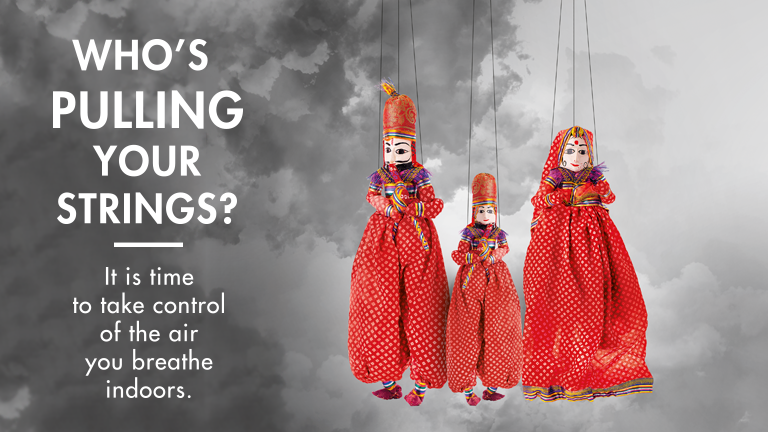 So, don’t let polluted air pull your strings. Bring home a Daikin air purifier for a healthy and pollution-free living.